I am looking for information, especially pictures of a Hobart Weldmobile. I think the one I've seen in Topeka, Kansas was from the 1930's or 40's. The fenders look strange to me, I'm not sure they were factory original. I'm a model builder. Scratch build out of brass and copper and would like to make it like it came out of the factory. I would like factory photos, brochures, or construction site photos that would have a weldmobile in them. I posted a link here awhile back, but not the pics. Alas, it is not there anymore. My bad. My old friend, Franz came to the rescue, as he often does whether you need rescuing or not...he is a wealth of information. The machine was built by Clark with a Hobart Bros generator. You might recall a few of them generators being PTO driven in Jeeps and M-37 trucks. 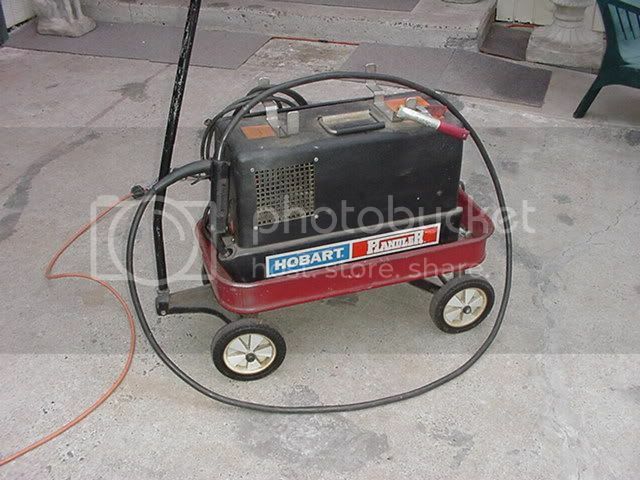 The picture is a Hobart "Big Wheeler" self-propelled DC arc weldmobile model SP-418-W or SP-618-W. There was also a smaller unit called the narrow gage weldmobile model SP-418-NW for use in plants with narrow isles and doorways using standard tires front and rear. The unit pictured is missing the Hobart name plate on the top front of the radiator cowel and the rear fender. Thr grill guards on the lights etc. were standard factory equipment. Finally figured out how to post a picture of the weldmobile I found in a storage unit. Does anyone recognize it. getting a more accurate date on it would be nice. Are the fenders factory original, or has somebody fabbed them up later? The drawings don't tell you much as far as what fenders and the like eventually looked like. There was one for sale on ebay a few years ago listed as if the reserve isnt met it will never be offered again. As far as I know it never sold.